FALLUJAH, Jun 12 (IPS) - Babies born in Fallujah are showing illnesses and deformities on a scale never seen before, doctors and residents say. Many doctors believe DU to be the cause of a severe increase in the incidence of cancer in Iraq, as well as among U.S. veterans who served in the 1991 Gulf War and through the current occupation. "We saw all the colours of the rainbow coming out of the exploding American shells and missiles," Ali Sarhan, a 50-year-old teacher who lived through the two U.S. sieges of 2004 told IPS. "I saw bodies that turned into bones and coal right after they were exposed to bombs that we learned later to be phosphorus. "I had two children who had brain damage from birth," 28-year-old Hayfa' Shukur told IPS. "My husband has been detained by the Americans since November 2004 and so I had to take the children around by myself to hospitals and private clinics. They died. I spent all our savings and borrowed a considerable amount of money." Shukur said doctors told her that it was use of the restricted weapons that caused her children's brain damage and subsequent deaths, "but none of them had the courage to give me a written report." "Many babies were born with major congenital malformations," a paediatric doctor, speaking on condition of anonymity, told IPS. 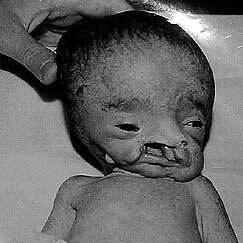 "These infants include many with heart defects, cleft lip or palate, Down's syndrome, and limb defects." The Fallujah General Hospital administration was unwilling to give any statistics on deformed babies, but one doctor volunteered to speak on condition of anonymity -- for fear of reprisals if seen to be critical of the administration. "We are experiencing a big shortage of everything," said the official, "We don't have enough specialist doctors and medicines, and most of the medical equipment is outdated. "We used to get many spinal and head injures, but were unable to do anything as we didn't have enough specialists and medicines," he added. "Intravenous fluid, which is a simple thing, is not available all the time." He said no new hospitals had been built since 1986. Iraqi Health Minister Salih al-Hassnawi highlighted the shortage of medicines at a press conference in Arbil in the Kurdistan region in the north Feb. 22. "The Iraqi Health Ministry is suffering from an acute shortage of medicines...We have decided to import medicines immediately to meet the needs." The COMMENTs of our readers are the sole responsability of their authors, and do not necessarily reflect the opinion of URUKNET. If you believe that any COMMENT contains pornographic, racist or otherwise objectionable or offensive content, or if the COMMENT is contrary to law in any way, please let us know. Our legal representatives will review any and all complaints and, if any complaint is deemed to be accurate, the COMMENT will removed at once. Do not complain to the Editor if you do not agree with an article or with a comment: simply reply here below.